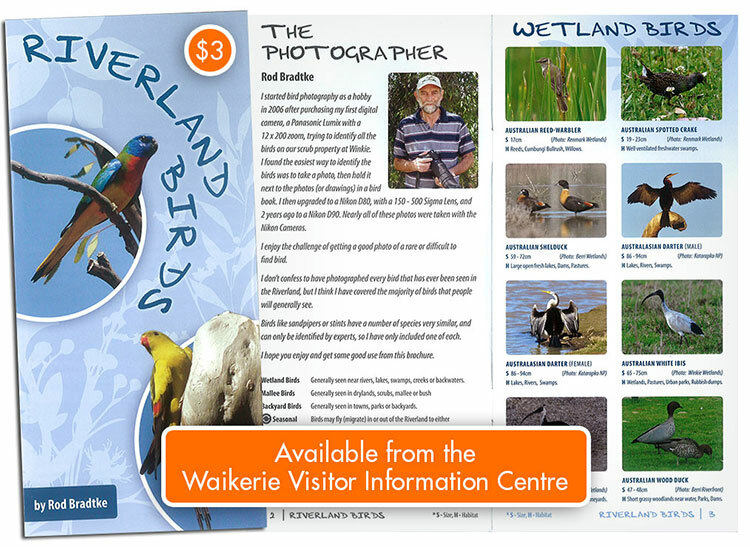 Waikerie is prolific with unique and diverse bird life. In fact we have over 200 species in the area. 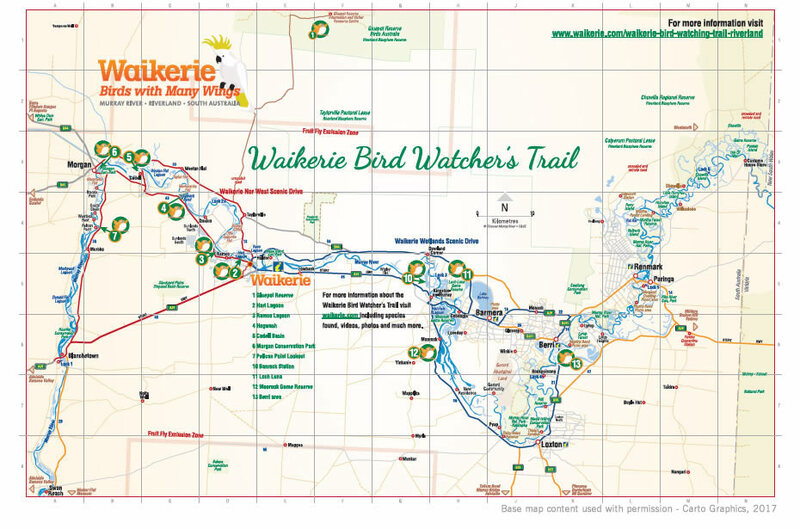 Waikerie is also commonly regarded as the gateway to Gluepot Reserve. However, there are many other quality birdwatching opportunities around. This information is intended to provide a self-guiding tour of the best birding sites accessible in a packed half day (excluding Gluepot) or a more leisurely one to two day experience. These sites have been included, based upon reliability, number and range of species found, and chance of unusual species. 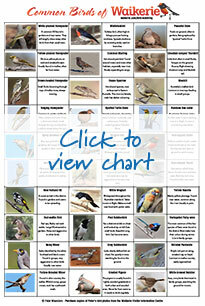 Gluepot is a birdwatchers' paradise with 190 species recorded including 6 that are nationally threatened. These include Black-eared Miner, Malleefowl, Red-lored Whistler, Regent Parrot, Scarlet-chested Parrot and Striated Grasswren. A further 17 regionally threatened bird species live there (eg Major Mitchell Cockatoo, Hooded Robin and Redthroat). 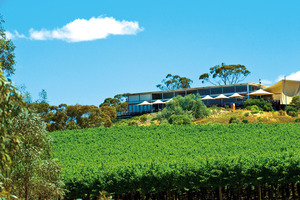 Facilities include a visitor information centre, campgrounds, birdhides, driving and walking tracks, and brochures. Environmental courses and workshops are held annually. Gluepot Reserve is located 1.5 hrs drive on well-maintained dirt roads north of Waikerie. The Reserve is open to visitors year-round. Entry fees are payable upon arrival. Visitors need to be self-catering and are advised to check local conditions prior to heading out. Gluepot Reserve is owned by Australia’s oldest national conservation organisation, Birds Australia, and managed by local volunteers. Gluepot is home to 50 species of reptiles and 12 species of bats. Fourteen signposted walking and cycling trails wind through the old growth Mallee and Casuarina woodland habitat. A 50km self-drive vehicle trail directs visitors to some of the diverse sites on the Reserve. Species lists and maps with walking notes are available at the Reserve. 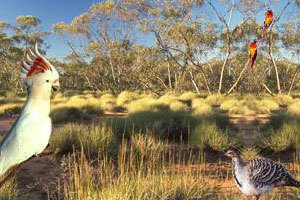 Access to the Reserve travels through private properties from the Morgan/Renmark Road. Visitors are encouraged to participate in research and monitoring projects that are being undertaken on the reserve. From Waikerie follow road towards Ramco. Just after passing Waikerie Caravan Park, on righthand side are the effluent collection ponds. Just past the ponds a small track veers off back behind the trees towards the ponds. Return to the road and continue on. After 500 m Is a parking bay for Hart Lagoon bird hide (slgnposted, righthand side). Good numbers of ducks and waders can be seen, and rails and crakes along the reedy edges. A walking trail starts here that takes you to the next stop (approx. 40 minutes one-way). Return to the road and continue on. After 2.0 km the road curves to the left after a yellow 55 km sign. Here a dirt track leads off (righthand side), winding down the hill back towards Hart Lagoon. It leads through a typical lower Murray River floodplain habitat of open woodland wlth dense Lignum and native grasslands. After 2-3 km the open sections of floodplain enable good views of a mud peninsula In the lagoon, which is usually covered in ducks, waders, Terns, white Egrets and Spoonbills which roost In the dead trees. More about Hart Lagoon. Return to the road and drive through the settlement of Ramco. Past the school is a turnoff (righthand side) with a brown sign 'Ramco Point'. It is worth driving all the way to the end (2 km) along the river (check flowering gum trees), then working your way back along the lagoon's edge. Salinity has taken its toll here and the signs are all too obvious, with the lagoon devoid of vegetation, dead gum trees and white salt scars on the ground. Return to the main road and turn right. A short way along good views over the lagoon can be obtained frorn a makeshift pullout bay. The vegetated banks on this side provide roosting spots for waterfowl. Continue along the road, following the signs to Cadell. The road leads through large citrus and grape growing areas. The turnoff to Hogwash (righhand side) is 14 km from Ramco Lagoon. There is a small signpost at the turnoff. It is a good camping spot but can get crowded here during Christmas and Easter. At other times the old Red gums provide good Regent Parrot habitat and there is a good chance of seeing a few here. Continue along the road. Do not turn off until 600 m past the Cadell township turnoff where there is a dirt track (lefthand side) with a signpost "Cadell Oval". Follow this for 700m until you see the basin (righhand side). There is a signposted birdhide here from which the entire water body can be viewed. There is a walking track all the way around the lagoon, with more bird hides. This natural floodplain depression is used to collect excess irrigaton drainage water that has dissolved natural salts to the soil. The water is released into the river at times of high flow to dilute the concentrated salts. Continue on the dirt road, turn right at bitumen road, right again at next intersection (right) Morgan. Continue for 6.9 km. There will be a sign 'Morgan Conservation Park'. Slow down and after 900m are 2 small white Conservation Park signs on each side of the road. From both, dirt tracks lead off to the well vegetated lagoon with similar species as above. The vegetation on the river sand dunes and flats is quite unique, and can harbour interesting species. The main shrub is Prickly Bottlebrush, a local endemic. Dryland Tea-tree, River Red Gum, Black Box and Green Myoporum make up the remainder. Continue on the main road. Just before the ferry turn left. This interesting dirt road through the Park provides many opportunities to stop. At the top end of the track is a unique spot where the mallee adjoins riverine vegetation at the edge of a river cliff, a situation that has become rare due to past land clearing. Where the dirt track joins a bitumen road turn right. From here to the next turnoff (Enduro Road, with sign "Waikerie" 32 km) is 25 km. The road leads over the top of the cliffs following the Murray River, with one official and a few makeshift lookouts on the righhand side. Directions: Another 15 km or so along the Sturt Highway, Banrock Station is well signposted. In order to get to the good birding spots, you will need to do their 2km, 4km and 8km long walks which include a boardwalk. All boardwalks closed if over 35°. Phone (08) 8583 0299. Bird lovers and photographers will find plenty to keep themselves busy at Loch Luna. As well as the usual species like pelicans, cormorants, darters and ducks, less common birds such as kites, woodswallows, spoonbills and wrens can be seen. Loch Luna contains a canoe trail along Nockburra and Chambers Creek. The endangered and beautiful Regent Parrot breeds in and around Loch Luna and can often be seen flying across the Moorook area. The dead gum trees are important roosting sites for darters, cormorants and other fish-eating birds, while high in the tree tops, you can find the nests of Whistling Kites. Moorook Game Reserve and adjacent Loch Luna are well known for waterbirds. The reserve is made up of floodplain and wetland environment including Wachtels lagoon and a series of narrow creeks and shallow swamps. Fishing and canoeing are popular recreational activities. The popular Kaliwiro Wetland Trail is an enjoyable way to see and learn about wetland environments. Notable species present there include Buff-banded Rail, Great Crested Grebe, Nankeen Night-heron and the rare White-bellied Sea-eagle. Directions: Just before the township of Berri on the right-hand side is the Berri Basin (turn off past the big winery), which is worth checking for ducks. The road continues on to Katarapko National Park (signposted), with floodplains and wetlands. Maps and information can be obtained from the Berri National Parks office Ph. (08) 8595 2111. A site where Redthroat and Freckled Duck have been recorded is Lyrup Flats. Redthroat can be found in the low salt/bluebush fields, and the wetland (with lots of dead trees due to salt) is good for ducks. To get there, continue on through Berri towards Renmark. Once on the highway on the other side of Berri, partway towards Renmark there is an overtaking lane leading up a rise. Over the top you’ll see the saltbush flats on your right. Lyrup Flats is signposted on the right. The content supplied makes no representation as to the accuracy, reliability or completeness of this information. Users of this information do so at their own risk.